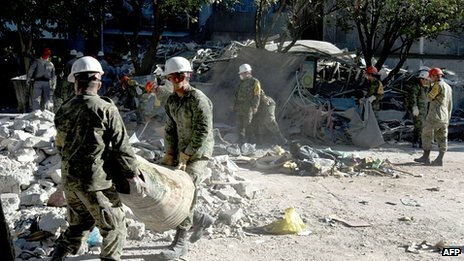 Thursday morning at exactly 4.00am a bomb hit some office buildings in Mexico. The police have been saying that the bomb was either thrown, placed next to the building or mysteriously fell from the sky - they don't know! There were about 32 people killed,100 were injured and 500 rescuers and dogs have been searching for people who are missing. Red Cross ambulances and helicopters have been taking the injured people to hospital. Also those who were caught up in the building at the time had the worst part of the blast. The president was also there after the tragic blast to say some words of comfort.This is BBC NEWS live. Thank you for watching. Maddy, I had no idea you were a roaming reporter! A great report which gave me a punchy summary of the tragedy.